Pick through berries to ensure all stems and leaves are removed. Combine the sugar and cornstarch in a large mixing bowl. Add the berries, and fold gently to coat evenly. Set aside while preparing the piecrust. Preheat oven to 425°F. Unfold the piecrust and cut out 5 inch rounds. Place piecrust circles on a nonstick cookie sheet. Spoon about 1/4 cup (heaping) of the berry mixture in the center of each, and fold up the edges in a rustic fashion, being sure to tightly pinch the edges (otherwise your tartlets could unfold!). Dot each tartlet with butter if desired. Bake for 20-25 minutes, until the tartlet crusts are golden brown and the filling is bubbling. Immediately before serving, dust with confectioners sugar, if desired. Even though I am not a pie baker, by any stretch of the imagination, nothing is easier to make for a quick party dessert than a little Berry Tartlet. This was a different kind of party than I usually write about. It was a Hay party! Hey, what, you ask? What exactly is a Hay party? Well, it involves friends and . . . hay - you know, the dried grassy stuff horses eat. I should explain. I recently spent the weekend with my sister. My sister lives on a scenic ranchette, a hobby farm – on the Martha Stewart-ish end of the spectrum - rolling green pastures, white picket fences, apple trees, and wildflowers. Amy has a greyhound, a herd of cute roaming kitty cats, and not one, not two, but three horses (albeit one is a pony who acts as a BFF for her temperamental dressage horse!). Well, Saturday is always a work day at the ranchette. The Saturday of my visit, a friend and her father were dropping off their annual (e.g. large) truckload of alfalfa hay. A crew of workers was there to greet them, and stack the hay in the barn for the winter. Hayfever waylayed me, and I was stuck indoors. Left to my own devices, I begin poking around in the cupboards for something to feed the hungry crew. Given the inimitable American invoked by the hay unloading endeavor, my thoughts turned to pie. 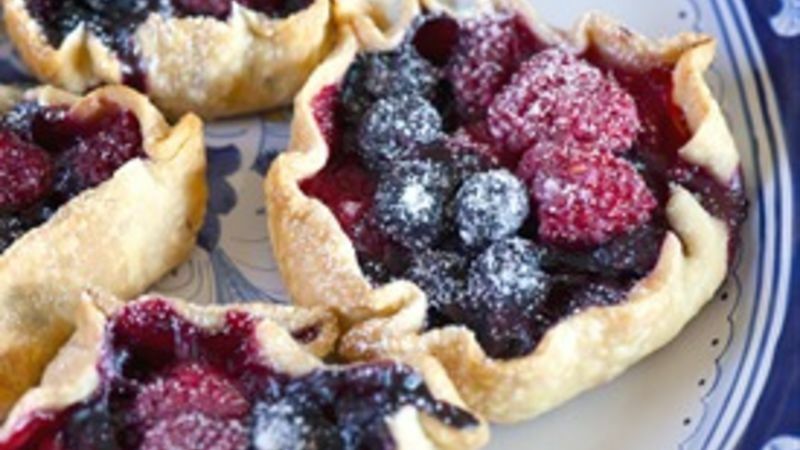 With Pillsbury Ready-Made Pie Crusts in hand, a Berry Tartlet was clearly the perfect treat! Mixed berries, powdered sugar and pie crust? Seriously, what's not to love? The tartlets came together in no time. First, I tossed the berries with sugar and cornstarch. Next, I cut the crust into rounds with a 5 inch diameter bowl – 3 for each pie crust round. Bake for about 25 minutes, cool, and dust with a little powdered sugar. So easy! The tartlet is my new go to dessert, for hay parties, dinner parties and beyond!! More Sweet Tarts to ? Check out Tablespoon's terrific Fruit Tart Recipe Collection for more tangy tart ideas!